Australia is a land of extremes. Searing heat, drenching humidity, sapping dryness and freezing cold; much of it could be encountered in a single long trip, so you’ll want to be prepared. And if you travel a lot in the heat or humidity, it goes without saying that a powerful cooling system can make your trip far more pleasant – air-conditioners dry the air, as well as cool it, and can make sleeping that much easier. Choosing the right systems to heat or cool your van is about far more than budget or functional capacity – it’s also about where you’re going to travel, how much cupboard space you can sacrifice, how big your RV is and which part of it you want to air-condition. Cooling is often handled by a standard air-conditioning compressor/condenser system, which may be reverse-cycle, or an evaporative system, although these are relatively uncommon. Webasto, for example, no longer sells its evaporative “byCool Camper” unit. Heating can be handled by an element, which is fitted to some air-conditioners with a heating function, or by a separate gas-burning or diesel-burning system, and by the reverse-cycle of some air-conditioners. Air-conditioning units themselves can be single-unit and ceiling or wall-mounted, split systems with a separate condenser and air-handler, or fully ducted and integrated into the build of an RV. Ducted systems are generally completely in-built, and are usually only a realistic consideration when you’re custom building a van or motorhome. If you travel a lot in the cold, you’ll want a dedicated heating system that runs on diesel or gas. They’re mounted on or near the floor, and are far more efficient heaters than the reverse-cycle or element functions of all-in-one systems. Installation is best handled by experts – installing an air-conditioner or heating system is serious business. In addition to the aesthetic and structural risks of cutting out large sections of roof or wall panelling, there are the safety concerns of condenser-unit fragility, high-voltage wiring, precise gasfitting and ensuring adequate ventilation. The best place to locate a suitable professional is your local equipment dealer or even the relevant manufacturer; otherwise you’re going in blind. The specifics of each installation are subtly different and depend on end usage. For example, if you want to heat an annexe, you can run venting to that side of your van, or if you’d like to heat specific sections of the van, ensure the system you’ve chosen can do so. You’ll also need to confirm where you want the return-air vent to be located, which would be on the offside if you’re planning to use an awning or annexe. For aftermarket additions, single-unit roof-mounted systems, reverse-cycle or otherwise, are the most broadly applicable. Split systems can sometimes be fitted, although they require some space for the condenser unit (like a domestic unit), and since the air handler (with the fan and ducts) needs to be up high, you’ll lose storage volume. If your RV’s roof isn’t reinforced (you’ll have to check with your manufacturer or dealer whether or not it is), you’ll need to compensate. For specific weights and carrying capacities it’s essential you contact your vehicle manufacturer, or a reliable engineer. In many cases, without a decent H-frame across the roof to support a roof-mounted air-conditioning unit, you could run the risk of ending up with one very expensive skylight. Galvanised H-frames go for about $130 online, and you should expect similar in-store prices. Dedicated heating units work much better than the heating system often tacked onto cooling system. Consider installing one in conjunction with an air-conditioner.Diesel units are very popular. 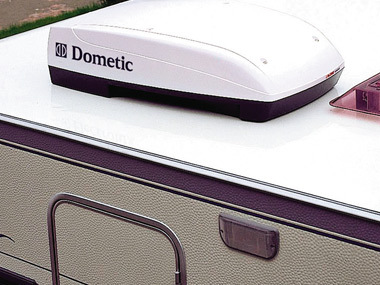 Dometic’s Eberspächer D2 (www.dometic.com.au) is a diminutive solution that can be plumbed directly to your motorhome’s own fuel tank, or can run off its own tank in a caravan installation. Before you grumble about sky-high fuel prices, consider that the unit is intended to consume as little as 1L every 10 hours on the low setting and around 1L every four hours on high. They’re reportedly easy to fit into tight spaces that you might otherwise not make use of, and come with the option of one or two heated-air outlets. The package includes two 2m lengths of hot air ducting, all fuel lines, clamps, hoses, exhaust pipers, mufflers and more, but doesn’t include a switch or a fuel tank, both of which are sold separately. A fuel tank will set you back about $170, a standard rheostat switch around $180 and a digital switch about $350. If you’re flush with cash, for $1300 or so you can control your diesel heater via landline or mobile phone with the Calltronic control system. The Dometic Eberspächer D2 weighs only 2.7kg, so it’s a viable addition to an existing air-conditioning system, even if it is reverse-cycle, and costs around $1700. Webasto (www.webasto.com) also makes a diesel heater, with four levels of output and capacity: the Air Top 2000 with 2kW, Air Top 3500 with 3.5kW, Air Top 5000 with 5kW and the intensely powerful HL90 with 9kW of heating capacity. For pricing and availability, you’ll need to get in touch with them. Small electric fan heaters and bar heaters have been the portable heating solution of choice for many years. They’re very power hungry and have a dubious (at best) safety record, and are cheap. Never sleep with the heater on, and make sure it has short-circuit and surge protection built in. Gas heating is also an option for an RV. Rinnai (www.rinnai.com.au) makes a compact gas-powered room heater, the Glowray 480, a tiny radiator with high and low heat settings, internal ignition and safety systems that detect both low ambient oxygen levels and an extinguished flame. The Glowray 480 is also protected by a wire cage to avoid those pants and gowns catching fire, puts out 2.2kW of heat and goes for around $500. 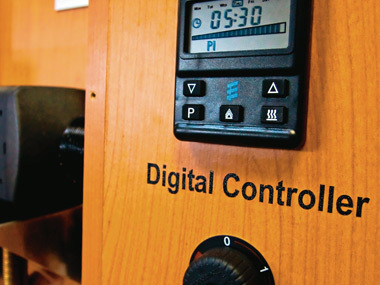 The ultimate in RV climate control is a fully-featured, set-and-forget, reverse-cycle air-conditioning system. While you’re not necessarily going to see the multi-zone fanciness seen in luxury sedans, what’s available to heat and cool your van has come a long way. Ultra-low profile roof-mounted units are increasingly commonplace and do the job admirably. Bear in mind though, that while you’ll have no trouble getting your RV interior toasty on a freezing winter’s night with the heating component of a reverse-cycle system, a dedicated heater is a better bet. Dometic’s B3254 is a roof-mounted reverse-cycle air-conditioner that’s designed for low-power, high-efficiency operation. It has a three-speed fan and protrudes only 265mm from the RV’s roof, while the interior section occupies only 64mm of interior head room. Air is heated by an element and both heating and cooling capacity is 3.2kW, and the unit retails for about $2000. Other Dometic options include the B3253, which uses an element for heating, rather than a reverse-cycle system, and a wall-mounted control unit for the B3254 that overrides the manually operated knob. The B3300 is a budget option, with an increased above-roof height as a trade-off. 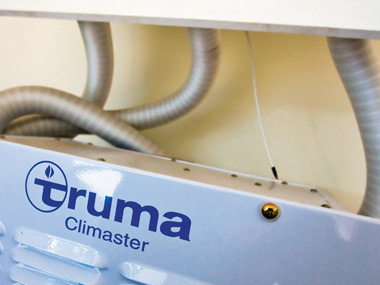 If you have an especially large RV, there’s also the Truma Climaster fully ducted heating and cooling system. The Ibis rooftop air-conditioner, made by Aircommand, claims to be the lowest-profile unit ever made. It boasts a number of innovations, including flip-down controls on the external portion of the unit, easily to clean air filters, and the ability to re-evaporate its condensate, which means you won’t have water running down the outside of your van. It’s intended to be simple to install, and comes with a handy remote control. The Ibis pumps out 3.2kW of heating and 3.2kW of cooling capacity, weighs 45kg, and goes for around $1850. Aircommand’s Heron 2.2 is a wall-mounted split-system with separate condenser and duct units. The duct unit (also referred to as the air handler) can be positioned precisely where airflow is most needed. We’re told it will suit vans up to 17ft 6in (5.3m). Cooling capacity is 2.7kW; heating capacity is 1.5kW. All up, the equipment weighs 34kg installed, comparable to most roof-mounted units, and costs about $1650. Aircommand also makes the Kingfisher, a one-piece wall-mounted unit that will suit caravans, pop-tops and motorhomes, has an LCD temperature and timer display, and features a dehumidifier to ease the breathing of asthma sufferers. The manufacturer says it’s not a simple aftermarket installation, as the compressor unit is quite large. The Kingfisher puts out 2.5kW of heating and cooling, weighs 52kg and costs around $1800. It may not have an adjustable temperature setting, but a skylight or all-season hatch should be high on your list of RV cooling configurations – there’s no electricity, gas or diesel consumption, air will circulate itself, and with the addition of insect screens, you will be left in peace. Dometic sells five different hatches in Australia, one each in mini and large sizes, and three in a medium size, one with push-up operation, one with a crank, and a third with 12V electric operation. The large skylight, the Heki 2, is fully insulated, with double-glazed glass. Four Seasons and Fantastic hatches are readily available too.